Experience window seat views of Mt Aspiring & Fiordland World Heritage National Parks as you fly through the spectacular Southern Alps from Wanaka. Four hours of unique New Zealand wilderness adventure in Mt Aspiring World Heritage National Park. Remote. Spectacular. Fun. Picturesque. Referred to as the Matterhorn of the South this spectacular mountain is 3030m high. Awe inspiring views of glaciers, rivers, valleys, alpine lakes & west coast rain forest. A half day pure New Zealand experience in Mt Aspiring National Park. Longer Flight. Easy Walk. Longer Jetboat Safari. Spot fish and Native birdlife. Love the Blue Pools. Walk the Swingbridges. Suitable for all ages. Be intrigued by the changing landscape as you journey to the mouth of the Makarora River and the headwaters of Lake Wanaka. An area rich in history and vistas. Local Driver. Local Knowledge. Great Value. Short of time? This is the option for you, enjoy the same Alpine highlights described in The Milford Sound & Cruise option. Either fly over the sound before returning or choose a brief landing and short bush walk. Plus Fox, Franz Josef & Tasman Glaciers. A breathtaking flight following the Southern Alps right to New Zealands highest peak of 3753m. Enjoy views of Mt Cook and Westland World Heritage National Parks. Grand Triangle - Experience it all. Choose the epic journey, combine Milford Sound, Mt Cook & Mt Aspiring flights and experience an amazing journey with views you’ll never forget! 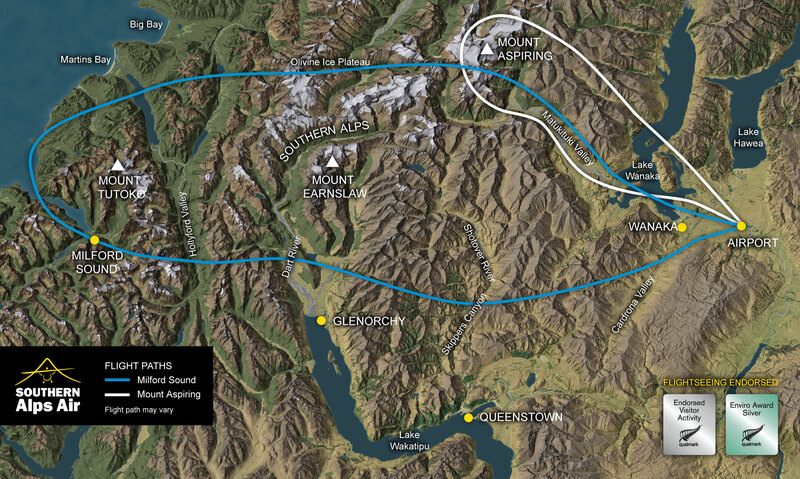 Southern Alps Air is Wanaka’s only locally owned and operated scenic flight company operating fixed wing . Window seats for every passenger. We take pride in offering unobstructed views. As a Qualmark endorsed company, we take pride in working to the highest industry standards. We try to actively reduce any adverse effects through buying wisely, using resources efficiently, disposing of waste responsibly, reducing noise pollution and providing an environmentally and socially responsible service to our clients.